• the biofilm is moving (rotating disc reactor). Figure 7.6 describes five situations of rate-limiting cases for the transport of oxygen. Because of the low concentration of dissolved oxygen in tap water at an air pressure of 1 bar (T=20°C, c* = 9.17 mg L-1 O2), the transport of oxygen is frequently the rate-limiting parameter. Before we study the rate-limiting processes in detail, we will discuss these cases shortly. (I) Mass transfer gas/liquid (air/water) is rate-limiting. All conditions met for nearly complete oxygen consumption. 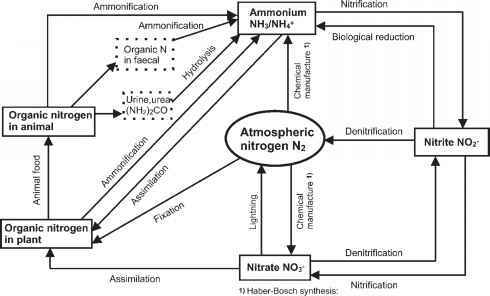 Substrate concentrations (organics and NH4) are relative high, bacterial concentration inside the biofilm is high and active, but air bubble surface area is low. The dissolved oxygen concentration decreases near the bubble surface to an even lower value. This resulting low oxygen concentration depends nearly entirely upon gas/liquid mass transfer. Fig. 7.6 Oxygen mass transfer in biofilm systems. (I) Mass transfer gas/liquid is rate-limiting. (II) Mass transfer liquid/solid is rate-limiting. (III) Biological reaction is rate-limiting. (IV) Diffusion and reaction inside the biofilm are rate-limiting. (V) Diffusion and reaction inside the biofilm as well as mass transfer liquid/solid are rate-limiting. 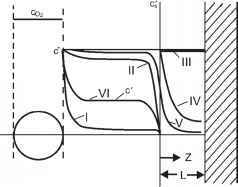 (VI) Mass transfer gas/liquid and liquid/solid are rate-limiting. dissolved oxygen concentration is only a little lower than the saturation concentration c* and decreases near the biofilm surface to a low value. This resulting low oxygen concentration depends nearly entirely on liquid/solid mass transfer. (III) The biological reaction is rate-limiting. (IV) Diffusion and reaction inside the biofilm are rate-limiting. As a result of a high aeration rate, a large biofilm surface area and/or activity and a high liquid/solid mass transfer rate, the dissolved oxygen concentration is only a little lower than the saturation concentration. It decreases inside the biofilm to a low value. (V) Mass transfer at the surface liquid/solid and the diffusion inside the biofilm are rate-limiting as a result of a high aeration rate. (VI) Mass transfer at both surfaces is rate-limiting. In the next section we will try to find relatively simple models for the calculation of the oxygen consumption rate for all six situations.